Our hand railing has gone from bare and grey to being covered in elaborate yarn designs, thanks to the handiwork and vision of one of our participants. The yarn has been carefully selected for its texture and color to accent the flowers and foliage of the garden. We have also watched on in anticipation as a new insect habitat has been erected. 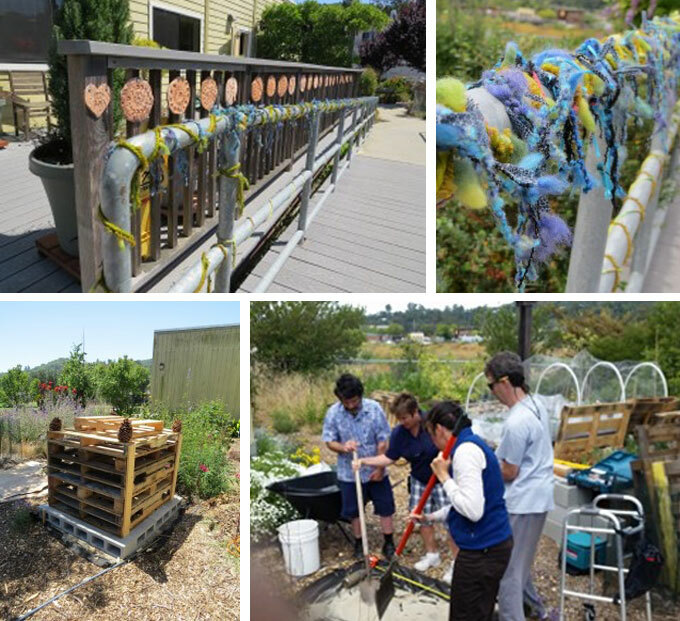 This project was inspired by similar habitats that our Marin Master Gardeners saw in England. We have been tossing around names for this new insect habitat, what do you think…Bug Hotel, Bug Hub, Habitat for Bug-manity? We continue to be inspired by the nature art that is being created in the BINBA therapeutic garden. It is lovely to watch it evolve on a daily basis and to see the participants spending more time in the garden in this hands on way. This week the fabric fence weaving has continued to emerge and grow with colorful designs. We now have rock sculptures, which were put together with considerable collaboration. The participants carefully set and balanced the stones. Adding to this beauty is a Zen succulent garden which was created start to finish by the particpants, who built the box and planted the succulents with great care. Once a month, BINBA clients don their chef hats and embark into a world filled with measuring, stirring, baking, cooking and tasting. 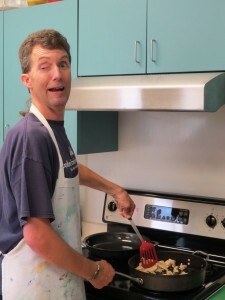 In Life Skills Cooking Class, clients come together to learn and grow through the art of preparing delicious food. 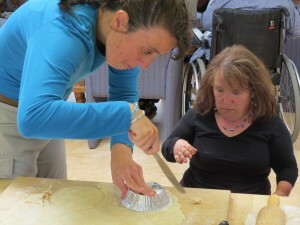 Today, clients made (and ate) chicken pot pie. Meanwhile, in art therapy class, the directive for the group was to create an image art of a familiar place that also represents safety.